Dr Blake's comment: Pain like this tends to be nerve pain unless proven otherwise. Nerve pain produces true suffering. Please go on the calmare website site and see if there is a local practitioner in Sydney. You can start with a pain management specialist. Also, consider buying a simple machine called Quell. Go to www.quellrelief.com to see what it is all about. Of course, these are medication free techniques. You may need gabapentin, elavil, etc. Unfortunately, it looks like Calmare is not yet in Australia. Dr Blake's comment: Yes, this could be coming from the back, and this is why you need a new pain person who can investigate the source. Dr Blake's comment: This is a great clue that it could becoming off your back or neck. also one dr suggested that the mri/ct scan may not pick this up as i'm in lying down position when there is no pain...is there any other way to find the exact cause of this? Dr Blake's comment: Typically nerve conduction studies with EMG can find the source. Yes, unfortunately, MRIs of the spine only show advanced problems. Slight bulging discs may not be seen when you take an MRI in a spine neutral position. I noticed your impressive blog, and would like to firstly say thank you for taking the time to help people with their concerns and questions. 1.) Is it possible, that because of the longevity of not having any intervention, that it may not heal? Dr Blake's comment: There are so many factors involved with sesamoids not healing, that it is hard to count them. Yes, delayed diagnosis can be one of them, but I have seen them heal fine after a year of misdiagnosis. So, you have to take that positive approach that you will heal just fine, once you start the 3 months of immobilization required. I would definitely do everything right from this point on, for example, wear a removable boot vs a stiff soled shoe. 2,) what is the role of reduced blood supply, in this area, and how does it contribute to not healing well? Dr Blake's comment: Supposedly the sesamoids do not have great blood flow, so the swelling from the injury causes too much pressure on the little capillaries and they can not push enough blood and nutrients in for healing. This is why I love contrast bathing for this deep bone swelling to daily flush out the excessive swelling. 3.) I have an air cast. If I release some of the air in it, and it helps me better control my right foot movements, is it okay to drive? I am referring to only an 8 minute drive to and from work? Dr Blake's comment: In California, you can not drive with a removable boot, which I think is a great law. It is impossible to react to driving situations that arise with one of those. It is better to wear a stiff soled shoe with a dancer's pad. 4.) would driving, on this right foot, which is the fractured one, with the boot, deter healing, or is it more an issue of driving safety? Safety!! 5.) could I drive, without the boot, for about ten minutes, and then put the boot back on? For sure, see my comment above. 6.) if this doesn't heal, can I just deal with it, as a chronic problem? The strange thing is that when I start to jog, run on treadmill, and get started with any activity, the pain tends to completely go away. Thanks again! I just read your responses to my multitude of questions. I appreciate all of your time. I am not too blog savvy, so I am not sure if there is a way to respond directly to the answers in which you posted on the blog. 1.) I was wondering what is meant by a stiff soled shoe? Is that a sneaker? Dr Blake's comment: That can be rocker based athletic shoes like the New Balance 928 or Hoka One One shoe line. Stiff shoes like some hiking boots or Hike and Bike shoes (made by Shimano or Pearl Izumi for example).You can definitely rotate as long as the 0-2 pain level is being maintained. a.) does an X-ray trump an MRI to assess a fracture? Sometimes it is seen better in a xray and sometimes the opposite is true. 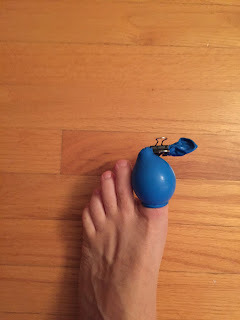 c.) does taping the toe, whatever this means, help? Spica taping can limit toe motion, and used alot in the return to activity phase of your rehabilitation. You are presently in the Immobilization/Anti-inflammatory Phase. 5.) Can I go swimming with two fractures, or will this disturb the healing process? No fins, and no pushing off the walls. The hardest part is getting in and out of the pool. 6.) I think I may know how I developed this injury. I was carrying a heavy tool station, up the stairs. It was just myself doing this. I believe I was caught in an angle, going up the stairs, so I ended up having the tool station rest on my foot. I had no other choice. Also, I would do stupid things, such as trying to snap a thick tree branch, by placing it under my foot, and pulling it upwards; and the same thing would be done to break down cardboard boxes for recycling. I am also a heavy walker, on hard wood floors, and usually don't walk heal to toe. As you can see, it could have been a combination of everything. Thanks for listening!!!!! You are welcome!! One of the athletes that has emailed me has severe heel pain. I had him email me his MRI CD which clearly showed a plantar fascial tear. I asked him to read my protocol and email questions. Here they are. OK Dr. Blake, here's what I can think of... I'm sorry it's so long but this is really playing on my mind - not just the cause, but the 3+ months in a boot and the rehab afterwards, the reinjury avoidance and the building back up to where I am now will be a task and a half - I'm up to it; I understand it could be much worse; I'm just not overjoyed! I’m 50, in excellent shape and thin. I’ve never had any foot problems; my arches are high (but not unusually high). Pretty much all of my shoes and sneakers have good arch support. I used to run a lot but I slowed my running down to only 2 days per week long before (12-18 months before) the 1st sign of heel pain. The other days I’m not running I would either be on the recumbent bike in the gym or out mountain biking. I'm a little bow legged and walk more on the outside of my feet (underpronate?). I realize you can’t be 100% sure but how much in your professional opinion did the 4 cortisone shots play a role in this? Dr Blake's comment: I have a patient now that I injected the area around the plantar fascia, and it sounds like it may be torn. It is considered safe if you do not inject right into the plantar fascia, which I did not. But, did the cortisone migrate up into the fascia weakened it? Was the chronic pain due to a plantar fascia weakened and ready to tear at any moment? I am not sure. If the MRI on my patient comes back as a tear, it will be the first in my 35 years of practice that has a possible link to my shot. I hope it was not my shot. I hope it was not the shots you received. Everyone is trying to help you athletes and shots are vital in the final healing of so many of these heal pain issues. How many shots are enough? Dr Blake's comment: I give 10 mg of long acting cortisone in a heel injection, and that is considered safe. Up to 3 of these shots over a 2-3 month period is considered safe in chronic conditions. I have seen patients with 10 shots in 3 months, only to find out that each shot only had 1 mg per shot. So, if you had 4 shots into the heel, you need to find out how much long acting cortisone was in each one. One of our orthopedists routinely gives 40 mg per heel injection. She says she has never had a problem. 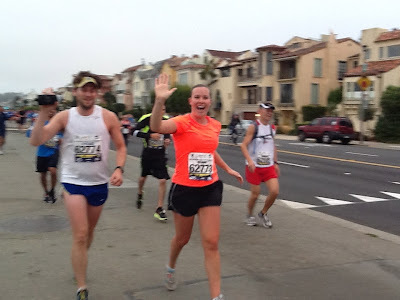 I can only tell you what sports podiatrists consider routine for them. Is this a common injury? Dr Blake's comment: Very, I have one or two patients weekly in some stage of healing, and they heal. I also had a patient come in a year ago saying he had chronic 10 years of plantar fasciitis. I told him plantar fasciitis never lasted that long. We got MRIs on both sides documenting bilaterral plantar fascial tears. After 3 months in a removable boot for one foot, and then 3 months in a removable boot with the other foot, he was well and kicking himself for self diagnosing all those years. I have pain on the opposite side on the heel about an inch forward from the back of the heel – ½ way between the side (of the foot) and the bottom of the foot/heel. Especially felt when squeezed (like a massage or at PT). Is this likely part of the same problem? Dr Blake's comment: Yes, the inflammatory fluid sits somewhere under the heel (which is where I inject) and can be just as painful as the plantar fascial tear. I typically have my patients walk on their heels. If that hurts, then heel bursitis is documented. I have them massage for 5 minutes with a frozen sports bottle just the 2 inch area under the heel, 2-3 times per day. Did you see anything else in the MRI? Dr Blake's comment: I will have to relook to answer that. Sorry, but I am at home, and the CD on my desk at work. I do not remember seeing anything else exciting. Are there risks associated with waiting to start to wear the boot? I was thinking about waiting until winter or at least the cooler weather. Dr Blake's comment: Now that you have a diagnosis, get the ideal treatment. Yes, patients wait, but if you don't heal well, and it could be related to waiting, you will not forgive yourself, and I could not recommend it. Are there other options (taping perhaps)? Dr Blake's comment: The basic treatment is to restrict big toe joint motion. So, find a stiff hiking boot, and/or a hike and bike shoe from Shimano or Pearl Izumi, or a rocker shoe like New Balance 928 or Hoka shoe line. See what limits the motion enough that creates that 0-2 pain level consistently. Is there more than 1 type of boot? If so, any preference? Dr Blake's comment: I love the Anklizer or the mid calf Ovation medical boots the best for these injuries. I assume I remove to bathe but must I be careful about putting any weight on that foot while showering? Does one walk on a boot or are crutches necessary? If I get up at night to use the bathroom must I “reboot” for the walk? Dr Blake's comment: All of the questions above can be answered together. You only hurt yourself with an active pushoff. You only need to walk flatfooted to the shower, bathroom. No need to sleep with the boot on. No need for crutches. Is driving possible? If not can I remove it to drive or is that not recommended? Dr Blake's comment: You have to remove to drive. Typically it is okay. If it is your right side and you are having too much pain driving, you have to get a cab or car pool. That part should only last 1 month or so, even when you are in the boot, stiff shoe for 3 months. Are there ANY exercises for cardio I can do (like rowing or swimming or the recumbent bike on an easy setting)? Dr Blake's comment: Yes, but you have to have the foot positioned so there is no heel lift. And, definitely no pushing off the wall in swimming and no fins. Is scar tissue going to be an issue? How can I get rid of scar tissue? Dr Blake's comment: We want scar tissue to scar in the tear. 6 months after the healing, if another MRI documents too much scarring, some PT will be in order. But, 6 months no plantar fascial stretching, and we have to allow scar tissue to do its thing. Can I stretch (calves, hamstrings, quads) while wearing the boot or should I avoid it all together? Dr Blake's comment: No PF stretches, but the rest of your body is fine. Any preference on how/what I should do for rehab after the boot is removed for good? Dr Blake's comment: So the boot creates this nice 0-2 pain level for 3 months. During this time, you have been cross training. The next 6 weeks you have to gradually wean out of the boot keeping the 0-2 pain level (can take as minimum as 2 weeks). Then I start you on the famous dreaded Walk Run Program all along keeping the 0-2 pain level. Based on how you do with this, we process you, or slow you down and get PT. We are definitely months away from this. Do you have any helpful advice to insure success during the boot and post-boot? Dr Blake's comment: The boot phase is easy. Maintain the 0-2 pain level, while trying to cross train, and experiment with stiff shoes, rocker shoes, orthotics, etc. The post boot phase is broken into the weaning out phase, the walk run phase, and the return to activity phase. Typically a good sports physical therapist or podiatrist can help you along. And, you are strengthening the foot daily all along from now until you are back full time. The exercises are met doming, single leg balancing, post tib and peroneus longus theraband, and at 4 months double and single toe raises. What's my best bet for orthotics (considering my arch and supination) for every day? Custom or off-the-shelf? Any specific ones you can point to? Dr Blake's comment: High arch and supination is only custom made in my mind. Any specific shoes/sneakers you recommend? Dr Blake's comment: See the Hoka line, along with the New Balance 928. Both have good rocker soles to limit pushoff. Good luck!!!!!! I'm writing to you to get your insights and hopefully share my journey with the other folks out there. I never want to join the sesamoiditis club but through your blog I really felt less alone. I now can pontificate for hours on sesamoids and feet (and why it's critical to have a good podiatrist) and it's a wonder I still have any friends left! I am 30 and an avid ballroom dancer (so dancing in heels on releve a lot!). Not overweight, and relatively healthy. I first started feeling pain in front of my right foot in late April, and I'd ice my feet and go back to dancing. But it wasn't getting better (I was probably at a 3 or 4 pain level at the worst - but I'm a baby about my feet), so I got an X-Ray and an MRI in May. No evidence of fractured sesamoids, but I did have a Grade 3 tear on the lateral sesamoid ligament. And now it appears I have bad arthritis in my big toe joint (from 2nd MRI - report at end of this email). After the first MRI in mid-May, I immediately went into an Aircast - I was 100% in boot any time my foot had weight-bearing for 6 weeks, and then I started easing out. It was still painful so I went back into the boot for 3.5 more weeks, with 1-2 hours then 4-5 hours after work in supportive Hoka shoes with padding (Dancer's pad and arch support). I'd also tape my arches for the first 8 weeks I was in the boot. I was able to achieve 0-2 pain levels for basically all of the 11 weeks since this "journey" started. I did 1 full month of 1x-2x day contrast baths, and now I do a warm soak in ginger water every night (my mom is a nurse who also studied traditional Chinese medicine, and she said ginger can help inflammation. In any case, I figured it can't hurt!). Dr Blake's comment: You have been doing everything great, limiting the bend at the big toe joint, and creating a great 0-2 pain level. Good job so far!!! And thank you for the humor!! I see a super wonderful podiatrist every 2-4 weeks since this started in May. I am taking glucosamine supplements, vitamin D, fish oil, and calcium chews. I never go barefoot. I've been out of the boot for a week at this point and I'm probably at a 0-2 pain level even with the padding. But I've read your post on good vs. bad pain, and I'm not limping, and I do have pain-free periods. I do metatarsal doming exercises 5x a week, and I am starting to go see a PT 2x a week starting next week. I am easing back into dancing - I have suede soles put on a pair of Hokas and I am doing some walking to music starting this week. In my Hokas, I can go up on a very slight releve without any pain. I am also getting a bone stimulator because my doctor said it might help with a bone cyst in my foot - in any case, it should not hurt, right? Dr Blake's comment: I love the idea of a bone stim for the cyst. Could you send a photo of the Hokas with suede sole!!! Everyone, this person really wants to get better, and is doing everything very smartly. It'd be amazing if you can help me calibrate the MRI report - i.e. should I be freaked out, very freaked out, extremely freaked out? :-/ "severe degenerative changes" sound horrible and I plan on living and dancing for at least 40 more years..
Dr Blake's comment: If you can take a photo of the xray or MRI that shows this severe condition, that would be great. You are only thirty, and I assume you have never had any problems with this joint before. May be an over read. If you can get me the MRI CD before Friday 8/26, I would be happy to look at. Mail to: Dr Rich Blake, 900 Hyde Street, San Francisco, CA, 94109. If you bend the right and left big toe joints upward, can you tell the injured side is alot more limited. 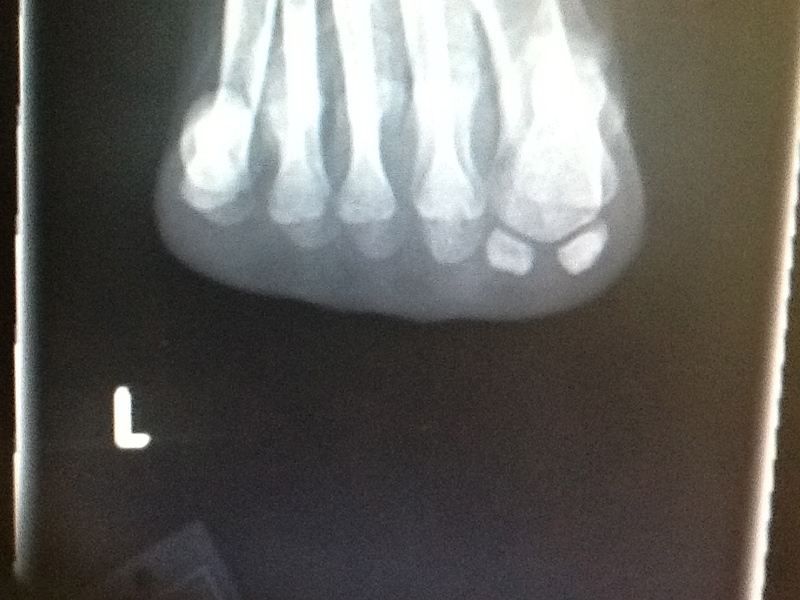 That is one of the definitions of degenerative big toe joints (aka Hallux Rigidus). Perhaps someone could also measure your joint range of motion like in the video below. 1. Is there ANYTHING else I can be doing to heal this faster and make sure I don't get injured again? Dr Blake's comment: You have created the activity pain level balance. Gradually increase your activity over the next few months. Do not set any goals to perform. Ice pack 10 minutes twice daily, and contrast bathing each evening. Met doming, single leg balancing, and calf stretches crucial (once a day except the calf stretches 3 times a day). 2. 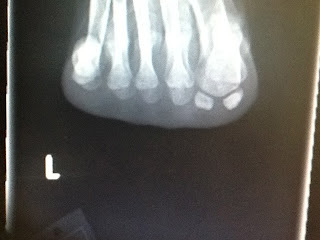 I have nightmares that I secretly have a fracture and it just haven't showed up yet - can you reassure me? Dr Blake's comment: No, unfortunately, I would have to see some imaging. Sorry!! 3. Should I get a bone density test? Dr Blake's comment: I hope everyone is reading this. Great question. 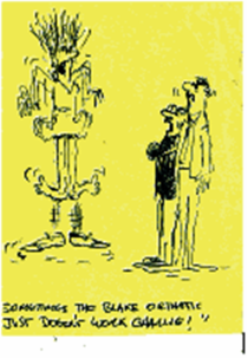 Yes, degenerative changes in a 30 year old could point to bone problems. I bone density test is a wonderful idea. If they find a problem, you have many years to right the proverbial ship. Dr Blake's comment: You need to change one variable at a time, and then level off activity when you add the next variable. I would gradually increase your dance next several months, then slightly lower intensity levels as you gradually introduce the heels first 5 minutes, then 10, etc etc. 5. When can I start working on PT barefoot (like standing on a mat, etc. ), and when can I go on releve? Is it all based on being able to do so with 0-2 pain? Dr Blake's comment: You definitely will need to maintain the 0-2 levels. Typically you see a PT once a week and they add more and more stress to the sesamoid area, like barefoot, like releves, like turns, etc. Thank you so much! I've never heard of sesamoids before this and now they consume 90% of my thoughts. 2. Moderate to severe degenerative changes across the lateral sesamoid-metatarsal head articulation with chondral degeneration and degenerative marrow edema along the distal aspect of the lateral sesamoid. 3. Mild degenerative changes across the medial sesamoid-metatarsal head articulation. Stable proximal retraction of the lateral seamoid. The abductor pollicis tendon is intact. Mild degenerative changes across the medial sesamoid-metatarsal head articulation. Cystic changes are more clearly seen at this articulation. Redemonstration of mild increased sclerosis of the medial hallux sesamoid. Moderate tendinosis of the abductor hallucis tendon and mild edema of the flexor hallucs brevis muscles (unchanged since 1st MRI). Intact plantar plate, flexor, and extensor tendons. Callus formation plantar to the second MTP joint. Minimal fluid in the first through third intermetatarsal space. No evidence of Morton neuroma. I came across your blog the other day and wanted to reach out to you with a question. I greatly appreciate your time and dedication to helping people. 5 weeks ago I had twisted my right ankle / foot somehow while walking on an unstable slippery surface. I felt a slight pain along the outer ankle surface along with an audible pop or (knuckle popping) sound. Dr Blake's comment: Golden Rule of Foot---pop without pain, probably no big deal, pop with pain, definitely a big deal. I was able to get back to my feet and walk without much pain. I walked on the foot without much pain that evening, however, in the morning, it began to hurt only with motion of the ankle joint when I pointed my toes downward or turned my foot (rolled) it inward. It also hurt when I touched or pushed around the ankle bone. Dr Blake's comment: For Grade I or 2 sprains, the pain may not come until you stop moving it and the swelling has time to set in. Grade 3 sprains (complete tears of the ligament) always hurt and swell within minutes to several hours. Walking was fine with a little bit of discomfort. The ankle also felt slightly unstable. Dr Blake's comment: The instability can be from ligament tearing or just fluid which collects in the joint and makes the joint surfaces float on each other (wobble effect). There was no bruising but the ankle was slightly swollen (not bad like some pictures I have seen). I iced the ankle, elevated it and compression wrapped it for the next few days. A week later I visited the doctor who examined the ankle, took x-rays (nothing appeared to be broken) and said it was a sprain and told me to wear a brace and let it rest. Needless to say, I did rest from my daily heavy activities (I am very active, run every day, etc.) but I did walk allot on it and did not really keep off of it. I have found the brace to make it hurt more so I never used it much. Dr Blake's comment: The difference in Grade I vs 2 sprains is that Grade 2 will eventually have some bruising due to the partial tearing of the ligament. So, we can assume that this is a Grade 1 sprain. 3 weeks later and the ankle range of motion has increased before I feel pain / tightness. I am now going on 4 weeks and the ankle still bothers me. The sensation I feel, especially when I am wearing short socks or gym shoes is like a rubber band around my ankle, very tight and along the top of my foot near where the foot meets the shin. When I point my toes downward it feels very tight and when I add a slight roll to the downward toe point I feel some pain. Dr Blake's comment: Everyone has a different pattern towards healing. Some swelling more leading to the tightness feeling you have. Some scar more leading to the tightness you have. Some ankle weaken more leading to tightness as the weak tendons try to work. So, there are many reasons for this. The swelling theory should be addressed easily with you doing contrast bathing twice daily for the next 10 days. The scar tissue and weakness may have to be addresses with a physical therapist, but you can try and see how single leg balancing and ankle active range of motion exercises go each evening for the next month. It is typical to ice the ankle for 15 minutes after strengthening. I am scared to go any further with the range of motion as I don’t want to re-injure it. There is no pain to the touch or from pressure around the bone now, but I still can’t run or do any agility exercises. Should I be concerned? There has been little progress over the last week as opposed to the first few. I figured it would be healed up by now and I could do some PT to strengthen it and flexibility and be all set. Dr Blake's comment: Plateaus are common in rehabilitation. And, you are smart not push through pain. I try to keep my patients in the 0-2 pain range at all times in the rehab process. 5% of ankle sprains are slow because of more significant cartilage damage interiorly. This may or may not be picked up by x ray, but definitely by MRI. If you can start a walk run program and let us know how you do, that would be the best test right now, other than imaging studies. Good luck. Keep in the 0-2 range and you probably will not hurt anything, even if you are not aware of all that is happening interiorly.